The Cheaponana's guide to the best credit cards for dining in Singapore | Cheaponana.com - The best credit cards in Singapore and other deals to help you save, earn and maximise your money! As Singaporeans, eating is our number 1 hobby and that is why banks have attached dining perks to some of their credit cards to entice people to spend. There are also multiple dining programs like the Palate Card & Feed at Raffles which will not be covered in this article. Here, we shall look at the best credit cards to have in your wallet, so that you can whip it out for your next meal! This is probably CIMB’s best credit card to date as it offers the best perks. There is a base of 0.5% rebate on anything and everything and 3.3% bonus rebate if you spend on dining, Visa paywave or online shopping (foreign currency). Do note that for dining, there is a minimum spend of $50 per receipt (like Citibank Dividend), and there is a need to make 3 transactions per month and hit $500 before you get the 3.3% bonus rebate. Morever, there is a cap of $50 for the bonus rebate, meaning that you should not exceed $1500 per month so as to maximize your benefits. The Citibank Clear Platinum Visa earns 5 Reward Points or 2 Miles per $1 spent on dining, online shopping and overseas spend – which is pretty similar to the previous CIMB Visa Signature card. Do note that there is a 5 year validity period for the Citi Rewards Points, but you are free to redeem for miles, cash rebate or vouchers. Best of all, there is no cap on your spending, so definitely great when you want to have a big feast! This is the oldest card that has been providing dining rebates as far as I can remember. Over the years, the rebate has remained at 2%, and now there is a minimum spend of $50 per receipt or else you will get the base rebate of 0.5%. Other perks will include 5% rebate at supermarkets and pharmacies and 5% rebate for petrol. Do note you need to accrue a minimum of $50 DIV before it gets credited into your Dividend account as a credit, and you have 12 months to do it before the DIV $ expires. Last but not least, there is a $800 cap on the rebate amount per anniversary year. Citibank, it’s time to catch up with the times as others have caught up and overtaken you. Surprised to see this card in the offering? From now till 30 Jun 2015, there is a promotion where you get 10 DBS points per $5 spent (i.e. 4 miles per $1) on dining, movies and drinks. Do note there is a cap of 600 DBS Points per month, meaning a cap of $300. If you are not a heavy spender, then this should not be a problem! Do note that the DBS points expire annually. As such, if you are not a heavy spender, then consider enrolling in the DBS Frequent Flyer Programme at a fee of $42.80/year where you can transfer miles in blocks of 1000 DBS Points (=2000 miles). But if you have less than that, then consider changing for vouchers instead. If you prefer rebates to points or miles, then this is probably the best dining card for you. Weekday dining will give you 3% rebate and weekend dining will give you 6% rebate. From now till 28 Feb 2015, dining in restaurants in hotels will earn you 6% rebate on weekends and 3% rebate on weekdays (do note that restaurants in hotels are generally excluded from these promotions). Other perks include a 3% rebate on online shopping, groceries (are we seeing a common theme here? 🙂 and telco bills! Drivers can get rebates at Esso and Caltex too. All you need is a minimum spend of $600 per month to qualify for the perks. The UOB Preferred Platinum AMEX gives you 10 UNI$ or 20 Miles per $5 spent on dining at any F&B establishments with the following MCC 5812/5813/5814. This includes bars, nightclubs, cocktail lounges and discotheques as well! Good news is there is no cap on this card. Bad news is there is an expiry date of 2 years for the UNI$ so plan your redemption carefully! Not every credit card is perfect – otherwise why would there be so many in the market? Do consider your needs and your spending habits before you decide on one that’s best for you. 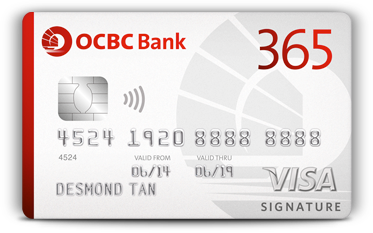 There’s no point using the OCBC 365 card on weekends when you spend only $100 that month and can’t hit the minimum balance or spend $500 on the DBS Black card when you will not receive bonus miles for $200 since there is a cap of $300? There are other cards in the market that provide a blanket rebate like the Manhattan card or UOB One Card but have not been included in this current article. Any feedback is welcomed.